Presentation at the Société d’Anthropologie de Paris (Poitiers, France). Beaudet A. et al. – Human evolution in South Africa: from bone collections to human origins. Beaudet A. et al. – The atlas of the Australopithecus specimen StW 573 (“Little Foot”). Beaudet A. – Paléobiodiversité et évolution des hominines du Plio-Pléistocène à Sterkfontein, Afrique du Sud. Beaudet A. et al. – Exploring the inner cranial anatomy of “Little Foot”: a comparative study of the endocast, and of the bony labyrinth. Beaudet A. et al. – The taxonomic diagnosis of the StW 578 cranium from Jacovec Cavern, Gauteng (South Africa): integrating inner and outer morphology. Beaudet A. et al. – Hominin cranial fragments from Milner Hall, Sterkfontein, South Africa. Beaudet A. – Comment reconstruire l’histoire évolutive du cerveau hominine à partir du registre fossile ? Limites et perspectives en paléoneurologie humaine. Beaudet A. et al. – Cranial vault thickness variation and inner structural organization in Plio-Pleistocene hominids from Sterkfontein Caves, South Africa. Beaudet A. & De Beer F. – The contribution of X-ray microtomography in reconstructing primate evolutionary history: examples of applications to the South African fossil record. Beaudet A. & Bruner E. – A deformation-based approach to the frontal lobe morphology in OH9, UA 31 and Bodo. Beaudet A. et al. – A high resolution microtomographic study of the StW 578 Pliocene hominid vranium from Sterkfontein Cave. Beaudet A. et al. – Morphoarchitectural variation in the extant human endocast. Beaudet A. et al. – Early hominin brain evolution: extracting paleoneurological evidence from the fossil record. Beaudet A. et al. – Reconstructing early hominin brain evolution from South African Australopithecus endocasts. Beaudet A. et al. – Identification of Homo-like features in virtually rendered South African australopith endocasts. Beaudet A. et al. – Time-related changes in fossil cercopithecoid inner craniodental structures and chronological seriation of South African hominin-bearing sites. Beaudet A. et al. – Full sequence dating of South African early hominin units based on new cercopithecoid chronological markers. Macchiarelli R., Beaudet A. et al. – L’extraction de la signature biomécanique du réseau trabéculaire fossile. Beaudet A. et al. – The Neanderthal patella: topographic bone distribution and inner structural organization. Beaudet A. et al. – Locomotion-related patterns of cortico-trabecular bone organization beneath the tibial plateau in extant humans, Pan, and Papio: a 2-3D high-resolution analytical approach. Volpato V., Beaudet A. et al. – Endostructural conformation and properties of the Neanderthal La Ferrassie 2 tibial plateau. Volpato V., Beaudet A. et al. – L’organisation trabéculaire du plateau tibial néanderthalien La Ferrassie II. 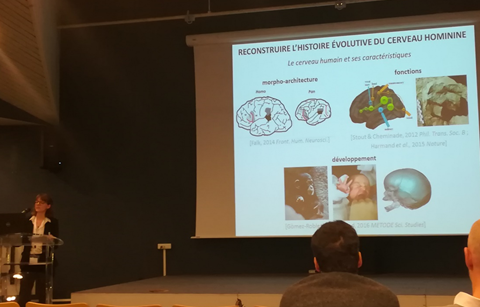 Seminar entitled “The Evolution of the brain, from pre-mammalian reptiles to humans” at the Origins Centre (Johannesburg, 2018): Human brain evolution: what can fossils tell us? Scientific meetings of the UMR 7194: Paléobiologie et évolution des hominines du Plio-Pléistocène en Afrique du Sud (link) (2018). Seminar at the University of the Witwatersrand: The contribution of the South African fossil primate record in unravelling the history of our ancestors (2017). Research Day of the Sefako Makgatho Health Sciences University: Human brain evolution: perspectives from advanced imaging techniques (2017). The Sterkfontein hominin assemblage: how the world’s richest Australopithecus-bearing site contributes to unveiling the human brain evolutionary history. Talk given at the University of the Witwatersrand, Johannesburg (South Africa), as part of the seminar entitled 3.5 million years of human evolution at Sterkfontein hosted by the French Institute for South Africa (2017). À la recherche de nos ancêtres : la lignée humaine. Talk given at Naintré, France (2015). Impressions 3D en paléobiologie. Talk given at the fablab “CampusFab” of the University of Toulouse Paul Sabatier (link) (2014).